There are a few foods that, if you haven't tasted them really fresh, you haven't tasted them at all. Among them, home grown tomatoes; freshly ground coffee; and corn on the cob. Obviously, the main attraction with corn is eating it—that sublime interplay of flavor and texture that only really fresh corn can serve up. (I like mine with a little butter and enough black pepper to make my lips smart.) M-m-m-m, I can't wait! But wait you must; first you've got to shuck it. Like so many of life's little chores, shucking corn can be a nuisance...or you can choose to see it as an experience, a joy. I highly recommend the latter. 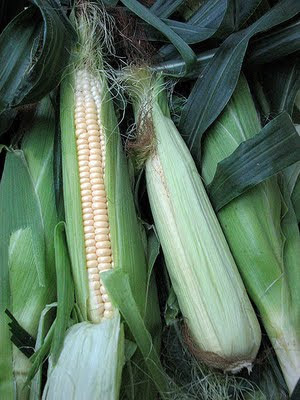 Pick up an ear of fresh sweet corn and the first thing you notice is that it's heavier than a green, leafy thing should be. I've always imagined that heavy gifts in small packages held special promise. The next thing that strikes you are the silken tresses spilling out the tapered end in bleached yellow-green, tips perhaps tinted golden brown by air and sun. The snug, raspy leaves peel back easily one at a time; try for more and they voice their squeaky objection. Layer by layer, the green softens from dark and paper-dry to light, tender, translucent. The last few reluctant layers squeeze tight, conforming like shrink wrap to the pebbly texture beneath. Emergent kernels, near the tip, wander randomly, then fall into neat rows as they march smartly down the cob. The kernels greet you cheerily, buoyantly. Slightly cool, they grab the tips of your fingers like so many tiny, shiny, pale yellow balloons all squeezed together— inflated, it seems, to the point of bursting. Emergent ones, near the tip, wander randomly, then fall into neat rows as they march smartly down the cob. Here and there someone loses the cadence and falls out of line for a step or two. A few strands always hold out, ducking stickily into crevices between rows. Then it's back to the silk. Most of it lets go willingly, but a few strands always hold out, ducking stickily into crevices between rows. I suppose this is where some might let the job get a bit tedious. 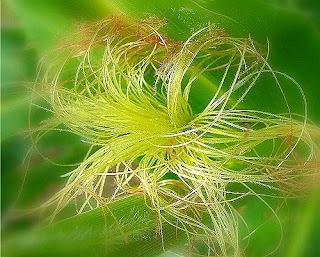 Don't let it spoil the wonder; a few threads of corn silk may even be good for you! Now just cut or break off the remaining stalk—appreciating the cob's tough, woody core, of course—and your cob's ready for the pot. Corn on the cob: whether you're shuckin' it, cookin' it or eatin' it, enjoy! NOTE: Some people tear off and toss their corn husks as they go. I like to leave them attached, and then imagine a great yellow rocket ship blasting off atop tongues of green flame. What can I say; I guess I've never really grown up! Mmmmm... I love corn season. I like to close my eyes and feel the rows of tightly packed kernels with my fingers. Dear Olivia -- Now you've got me salivating and looking for a corn stand! Yes, it's such a treat - related to the other post you commented on. Would we appreciate fresh corn this much if it weren't available for such a short time? 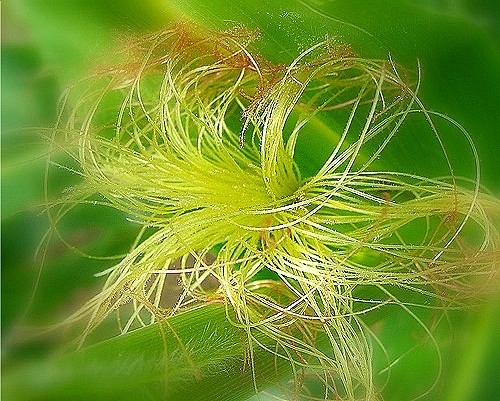 I love the intimate detail in your corn experience!! Yay..CORN! I love roasted corn from the Kentucky State Fair... It's almost Fair time and I can't wait! I will think of this blog while I enjoy each delicious kernel! Great blog! Bebbi -- Thanks for your support, my friend! At the KY fair, do they roast the corn in the husk? We may have the same franchise here in MN. We love sitting on the curb, munching our corn and people watching!